There has been a lot of talk among columnists and talking television heads about the sad state of the world’s financial system, the collapse of the real estate market, the failure of banks to lend money needed to get the wheels of commerce turning, and the strange decisions by big corporate boards to award their chief executive officers with multi-million dollar bonuses at a time when an estimated quarter of the nation’s citizens are out of work. We also notice the annual Forbes’s Magazine list of the world’s wealthiest billionaires and glare with amazement that so much money rests in the hands of so few people. And our heads spin when we hear of national deficits climbing into the trillions of dollars and we cannot understand how our legislators in Washington could have let such an imbalance happen. It does not take a financial genius to see that twisted bookkeeping has been going on and that the wealth of the world is now being controlled by power figures at the top of the human food chain. But the people pulling the strings do not appear to be the likes of such well-known billionaires as Bill Gates, Warren Buffett and Mexico’s Carlos Helu. The real power figures are names and faces that we rarely see or hear of. They include names like Rothschild, Rockefeller, Kuhn, Loeb, Mossesschieff, Warburg, and Lazard . 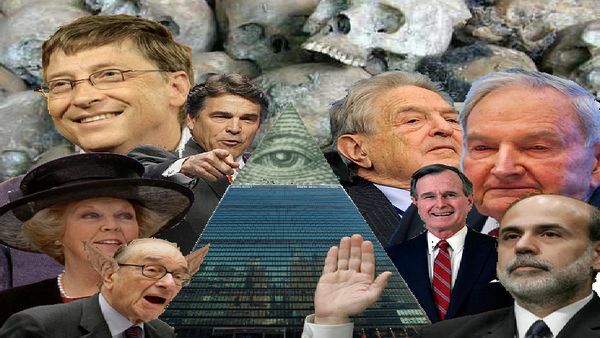 . . banking families that secretly control the wealth of the world from behind the curtain. The media talks about American banks that have grown “too big to fail” with names like Citibank, Bank of America, Wells Fargo, and Morgan Stanley, many of them receiving “bailout” money from the federal treasury after the housing bubble collapsed because of reckless lending practices. We heard of the Goldman Sachs Group, yet another powerful financial institution operating on a global scale as an investment banking and securities firm. We also heard of Freddie Mac and Fannie Mae, the names of the two largest mortgage finance lenders in the nation. It seems that these two organizations, although privately owned, were protected by the federal government and consequently were covered after so many bad mortgages were sold through these offices then split into parcels and sold to investors all over the world. The practice has confounded the courts now that banks are attempting to foreclose on default mortgages because nobody knows who really owns many of the questionable mortgages. The banks of America operate under the Federal Reserve Banking system. If you look at a dollar bill it reads “Federal Reserve Note” across the top. That means it is a note and not legal tender. The U. S. Constitution requires that all real money be minted in gold or silver coins, and that paper money must be backed up by its printed value in either gold or silver stored somewhere under government control. This is why gold was once stored in guarded vaults at places like Fort Knox, Kentucky. Today, however, there is no longer enough gold or silver in those vaults to back up the kind of money we are recklessly spending and years of runaway inflation. Inflation has been caused by the Federal Reserve’s practice of printing more and more notes and giving the market the appearance of more money in circulation. What is happening is that the dollar is losing its value not only in the United States, but on world markets. There also exists a World Bank and an International Monetary Fund, both of which appear to have some control over all world banking systems. And there is yet another institution that most people have never heard of. It is called the Bank for International Settlements (BIS). The BIS is believed to be the most powerful financial institution in the world. It is headquartered in Basel, Switzerland. It does no direct business with individuals, governments or even corporate entities. It deals only with 55 member nations’ central banks, most of them privately owned and controlling most of the financial value in the world. The banking system is a confusing and complex operation that most Americans do not understand. Big money interests have carefully designed it this way so that few people understand the shell game that has been occurring right before their eyes. In this way the world’s wealth is being carefully controlled by the people behind the curtain. What appears to be happening today is that a decision has been made to stop the circulation of money. This is bringing the capitalistic system that the United States has known and worshipped to its knees. Money that is not circulating has no value. When people cannot purchase the farmers and the manufacturers have no market for their goods. Commerce grinds to a halt. This appears to be occurring by design. The financial crisis occurring throughout the world has not been entirely the fault of key bankers erroneously making bad real estate investments. We must ask if it is not part of a plan to destroy the financial market system as we know it. Where is all of this leading? It should be clear that with the help of world trade agreements that there is a shifting of industry to areas where goods and services can be provided by cheap and non-union labor. For the masses this is human slavery in disguise. We have been sliding seductively back to the middle ages. Without realizing it, we have allowed ourselves to become surfs devoting our lives for the pleasure of the kings that control the wealth and power. Thus the bankers and handlers of the world's wealth appear to be members of the shadow government that controls our lives.